Light a lamp with six wicks is a special offering to Goddess Tripura Sundari. Such a lamp is lit to achieve eternal prosperity in the house. One of the main benefits of lighting the lamp is that it helps in achieving auspiciousness and solving wealth and property related issues. When to light the six-wick lamp? Evening on Shukla Paksha Pratipada – the first day during the waxing phase of moon. When there is Shathabhisha or Sadayam or Chathayam Nakshatram in a Hindu lunar calendar. It is doubly auspicious when there is a combination of Shukla Paksha Pratipada and Shatabhisha Nakshatra. How to light the lamp? The lamp should be lit in the evening just before sunset. The person lighting the lamp should wear pink color dress. The lamp should be lit on the north side of the house. Ghee should be used as the medium to light the lamp. After lighting the lamp, sit in meditation. 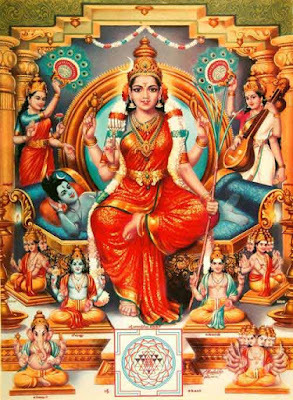 Then read the Lalitha Sahsranama Stotram.